Maren H. Brown was born on July 27, 1923, in Lafayette, Louisiana. She is preceded in death by the love of her life, beloved husband of over 60 years Howard L Brown Mobile Alabama, sons Stephen B. Brown, Silverhill, Alabama, David S. Brown, Mobile, Alabama Howard (Buddy) Brown, Bay City Texas, William (Billy) G. Brown, New Orleans, Louisiana., and daughter, Deborah K. Brown, Mobile, Alabama. Maren is survived by her oldest daughter, Ellen B. Douglas (Henry) of Mobile, Alabama, and youngest son, Kevin P. Brown of Fairhope, Alabama and one (1) cousin, Karen Gunderson of Portland, Oregon. Maren had sixteen (16) grandchildren, twelve (12) great grandchildren and seven (7) great-great grandchildren. Maren passed peacefully at home on January 15, 2019, surrounded by love ones. 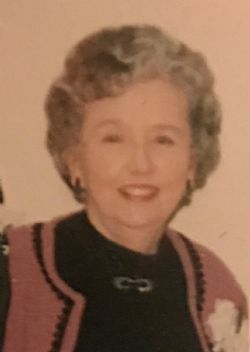 Visitation will be at Mobile Memorial Gardens Funeral Home on Friday, January 18, 2019 from 1:30 pm to 2:30 pm. Graveside services to follow at 2:30 pm in Mobile Memorial Gardens. A chapel service will be held at 2:30pm on Friday, 01/18/2019 from Mobile Memorial Gardens Funeral Home, followed by a committal service at the grave site. Maren was a kind, wonderful woman, devoted to her husband, children, mother, and never-ending (and very lucky) pets. She was my favorite cousin, always up for a visit despite our age difference and being on different coasts. She was also my father’s favorite niece and he would regale us with stories of her visit to San Francisco as a young woman. Her hospitality was unsurpassed and I continue to enjoy the Southern recipes she shared with me. I am proud to have been related to her and will miss her. My sincere condolences to the rest of the family.